When my first grandson was born, my husband and I made a few decisions about selecting his (and future grandkids’) gifts. We didn’t want to load our grandkids up with a lot of stuff they didn’t need, or get in the habit of spending a lot of money on toys every time we got together. That’s not to say I don’t love to give gifts! I enjoy the whole process of giving presents: selection, wrapping, and giving. Christmas at home was always one “splurge” gift and a lot of little practical items like socks, gloves, and books for the members of my family. Actually, creating fun with grandkids at birthdays and holidays sans all the “stuff” has become a challenge I welcome. If I’m patient enough, inspiration eventually comes! Also, it’s been helpful to have my daughter and son-in-law share their expectations with us. By the way, I’m leaving off the obvious choices: Legos, Play-doh, Thomas the Train. Chances are, your grandkids already have these classics! These ideas are for kids about 3-5 years old. Also, I unabashedly include pictures of my grandsons playing with many of these toys. 1. Give gifts made of out natural, eco-friendly materials. 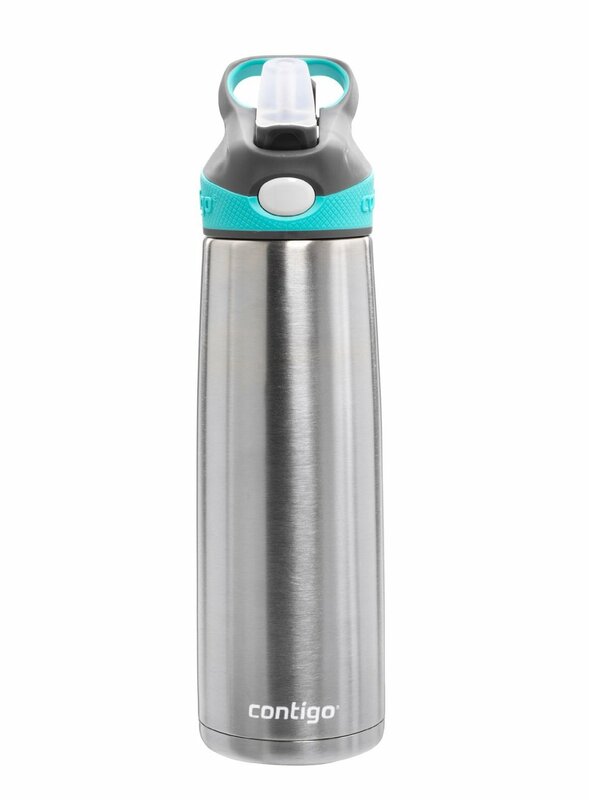 Contigo offers a variety of colors, styles, and sizes. We chose the 20 ounce so the bottles would accommodate my grandchildren as they get older. Besides being eco-friendly, these bottles keep their water cold for several hours. Plus, our two year old can push the button himself. Fun and practical! Wild Mint offers a variety of toys and other products that are chemical free for the environmentally conscious family. For a quick read on non-toxic products for kids, check out Hannah’s post, CEO of Wild Mint. Melissa and Doug toys are made of toxic free materials like those from Wild Mint. This is the brand I’ve found at our local consignment shops and garage sales, so I’m more familiar with Melissa and Doug toys than other “green” products for kids. 2. 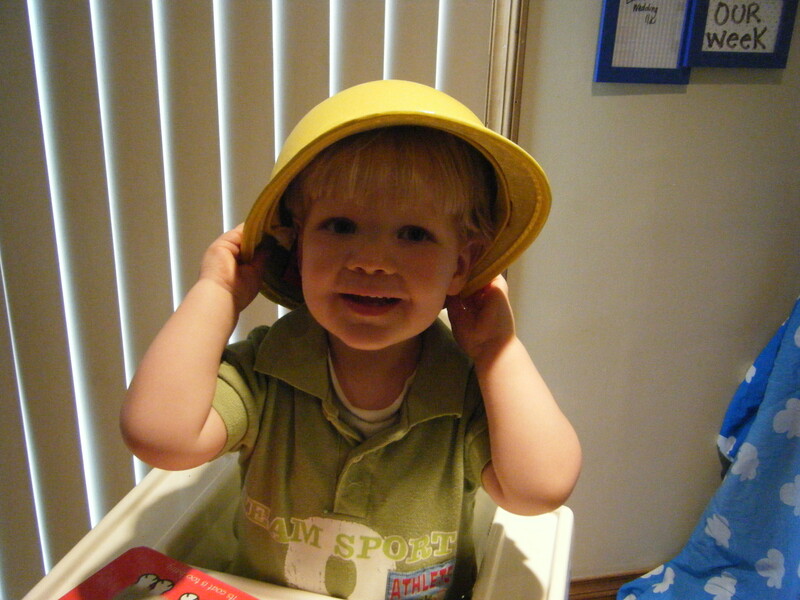 Buy toys that develop cognitive skills and eye-hand coordination. Kapla Blocks~ Jim and I found these at a children’s shop dedicated to all things Kapla while vacationing in Myrtle Beach. My 4 & 5 year old grandsons spent hours with these at our home Thanksgiving week. I’m still in awe of their designs. Melissa and Doug Puzzles~ Check out this link for a variety of puzzles for pre-schoolers at different skill levels. Busy Board~ My son-in-law made this busy boy board for Silas’s birthday. He hung it at my grandson’s eye level in the dining room. The boys love it. 3. 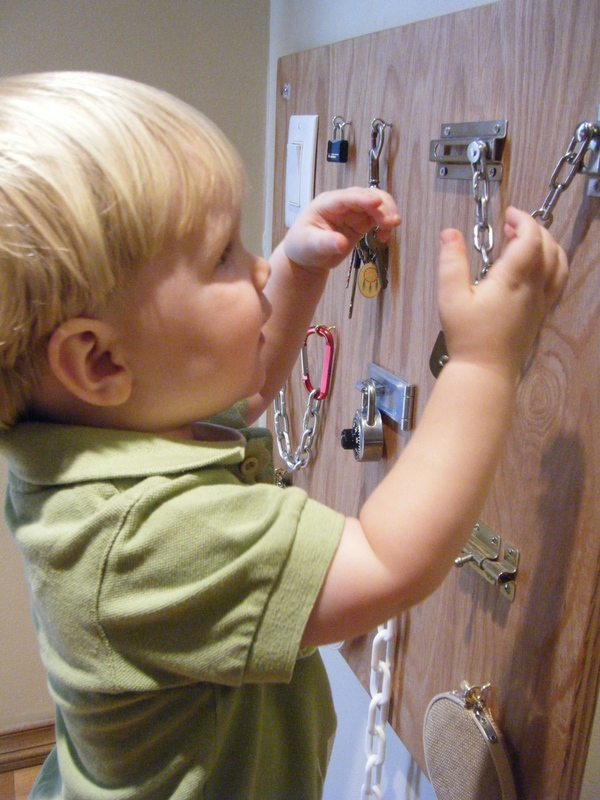 Choose items that nurture creative play. Hats~ cowboy hats, engineer/conductor hats, Indian headdresses, sombreros, construction worker hats, fire chief hats etc., etc.! 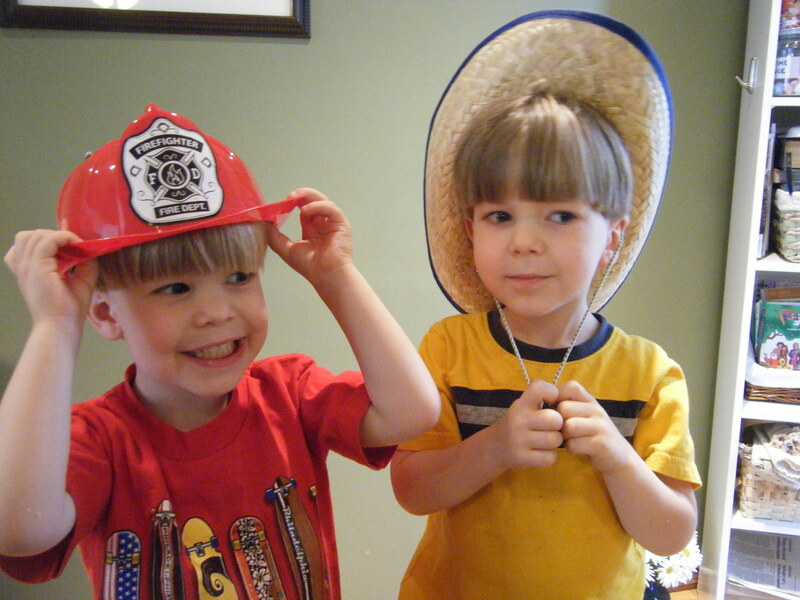 Our pre-school grandsons love wearing hats of all kinds. Sand and Water Table~ my friend, Jeff, actually built his daughters their own sand and water play station; an ambitious yet inexpensive endeavor! If that’s not your cup of tea, Step Two offers an excellent set-up complete with an umbrella to keep the sun out. Dress-up Clothes of All Kinds~ Check out Goodwill for these. 4. Provide avenues for artistic expression. Do a Dot Markers~ My daughter introduced me to these. Besides the markers, you can purchase coloring pages plus a whole lot more Do a Dot items to spur on creative minds. Beads to String~ My pre-school grandsons LOVE making colorful bracelets and necklaces for their Mommy. Spot It Junior~ a colorful matching game. Slinky~ Get the plastic ones and play on carpeted stairs. For some reason unknown to me, watching a slinky make it all the way from the top of the stairs to the bottom elicits tons of giggles from our little ones. Knee Hockey~ Apparently, younger children play hockey while on their knees. This is news to me! Cindy explained, “Our grands are 6&7 this year and we got them a knee hockey game, complete with goals and little sticks. Before, I was cutting and duct taping paper tubes to use as hockey sticks. We use small nerf balls the size of golf balls. But I got some small foam pucks for this year. If you’re like me, you might be thinking, “what about books for Christmas?” I think that’s a great topic for another post! Hope to hear some of your good ideas for grandkids. Wish I had grandkids so I could follow your suggestions! Great ideas, Donna. We love the Melissa & Doug toys and buy them often. They’re fun, retro, and well made, usually out of wood. Another company we like is B. Company, which Target carries. 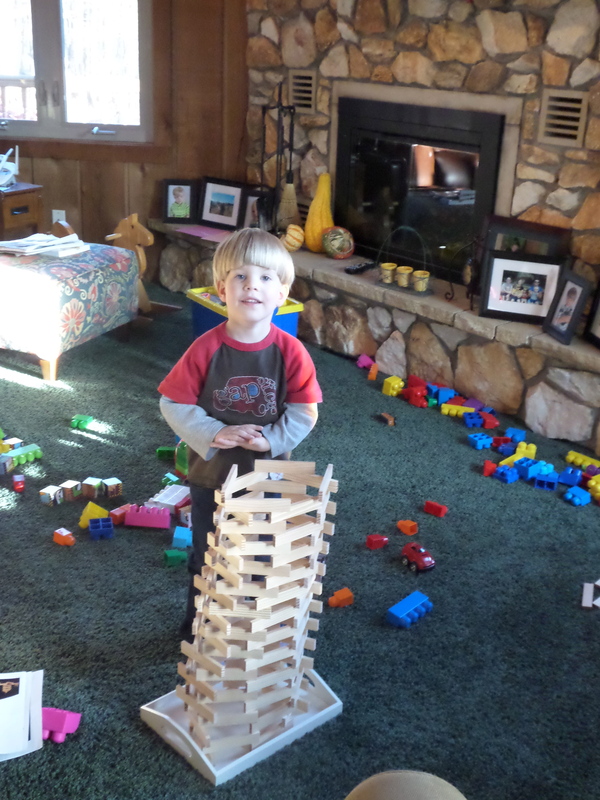 Their blocks are our grandsons’ favorites and work well for toddlers/preschoolers. I love the dress up clothes idea. I’m going to fill an old trunk with Goodwill items and keep it at my house for the grandkids. Thanks for the tip! I will check into B.Company. Thanks! !